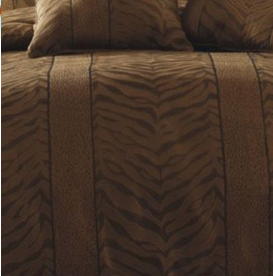 Do you love exotic animal prints but prefer a subtler, more modern look for your bedroom? If so, you have found the perfect compromise with the Kenya Zebra Leopard Gold and Black 8 Piece Comforter Set. The set may be a bit less eye-popping than other animal print sets you’ve seen, but what it lacks in outrageousness it makes up for in elegance. With the comforter’s subtle, brown background and bold black and gold trim, you can count on ultimate elegance that exudes luxury and personality. Because of the attractive and unique look of the set, you can count on a great match with your bedroom’s current decor. Add a classy, wild touch to your room with this soft and sassy comforter set.